Here are photos of different style of tracer box from the FN factory. Headstamp is the same as the one Gyrojet posted. Bullet has a red tip and a green primer seal. Box text suggests that it was destined for the German army. Lots of discussion since I last looked at this thread. For some reason, I don’t seem to get any of the Topic Reply notices after the first one or two on a thread. Anyway, thanks TonyE and all for posting the 7.62 box pictures. Unfortunately, the FN 54 cartridges I will be getting are without boxes, so I won’t be able to determine positively what country they were intended for. Were other countries besides Canada using FN manufactured 7.62 in their testing in 1954? Nice boxes and cartridges. Thank you for sharing. [quote=“Dave S”]Here are photos of different style of tracer box from the FN factory. Headstamp is the same as the one Gyrojet posted. Bullet has a red tip and a green primer seal. Box text suggests that it was destined for the German army. Dave, the FSN# given on the label has the country code of Germany, so it was definately for Germany. 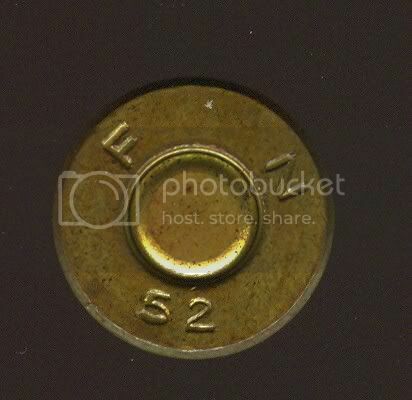 I don’t know whether this was intended for their own experiments or whether it was made on behalf of somebody else but this must be one of the very earliest Belgian 7.62x51mm rounds. That is a very nice early round. I would think at that date it was for use in the BBC (Britain Belgium Cnada) investigations. Can you post a picture of the whole round as I would like to see the bullet profile. Prior to 1955, the US 7.62 cartridges were designated by the various loadings and bullets, such as T104E1 for Ball, and T93E2 for AP, etc. After official standardization they were called NATO CAL 7.62MM BALL M59, or 7.62 MM NATO TRACER M62, or some variation of those two. Correct me if I’m wrong, but I believe that the Brit cartridges were always designated as 7.62mm BALL L2A4, 7.62mm TRACER L5A2, or somthing similar. That Belgium cartridge makes me wonder exactly how they were official designated. But, my question. I don’t recall any designations that include “x51mm”, as in 7.62x51mm. And yet, that is a name that we all seem to use. Does anyone know how such a nomenclature may have originated??? Just curious. It’s a slow morning. Thanks Jim, I shall try to grab one. Ray - You are broadly correct about the British designations for 7.62mm NATO, and I suspect the 7.62 x 51 came about because this is simply the usual way a cartridge is described in Europe. It distinguishes it from 7.62 x 54R or 7.62 x 63.